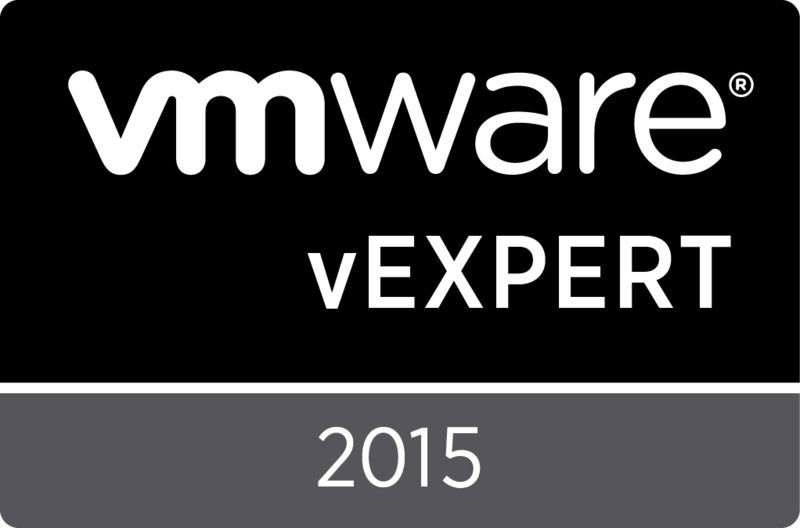 On Feburary 5th, the 2015 vExperts were announced here. I won’t get into the details of each (you can look at the application page for more info), but I applied last fall under the Customer category thinking that would be an easier route than Evangelist. I didn’t make it and I was pretty confused (as a customer I thought I interacted with VMware and social media quite well). I did reach out to people on twitter and I found one person who made it to vExpert as a Customer but that was part of a really large project that had wide visibility inside VMware. I am very happy and appreciative to receive this honor. One thing that I noticed last year, is that the number of vExperts has grown tremendously. This sat in the back of my mind as I saw the 2015 announcement with over 1000 people. Honestly I was just glad to be in and didn’t put too much thought into the number of people who were selected as vExperts. Romain Decker’s blog has some good breakdown of the numbers for the past couple of years. Even though I had similar thoughts, I still got really irked that someone else was actually saying it, and not just talking about the shortage of freebies. I think what bothered me is that I just made it in, so saying that there are too many is pretty much a punch to the gut saying that I don’t belong. More vExperts means more ‘evangelization’ of VMware products. This can be from more blog posts, social media interaction, etc. Looking at this short list of pros/cons, the large amount of vExperts definitely helps VMware in terms of social reach and content generation. The individual users gets some recognition, some forum access and maybe some free stuff from vendors. I definitely understand that capping the number of vExperts would make it that much more of an achievement, you can’t just give it out to the 50,000 VMworld attendees and have it hold same weight for example. At the same time, keeping it to 300-400 (as it was in 2012) makes it an ol’ boys club that would be difficult to get into. I don’t know how the VMware team chooses vExperts (raw number of blogs vs social media participation vs forum participation), but assuming that the vExperts from 2012 maintained similar metrics year after year, it would be hard to topple an incumbent. Turnover would have to be from people not re-applying. That doesn’t really do VMware any good if their goal is to spread the word. The program focuses on recognizing those who help others out on the forums. Seems to be hard capped at 4000 for now. Employees are excluded, but this makes sense since MVPs are helping people for free. Cisco Champions, EMC Elect and PernixPro are relatively new programs that focus on Evangelization as well as interaction with product management/engineering. I’m probably diluting that a bit, so be kind. The most useful comparisons are probably between the well established MVP and the newly formed Cisco Champions. Microsoft has a huge reach, and based on raw numbers alone, MVPs make up 0.004% of the Technet user base. I’m not sure if that 100 million users represents active users or registered users, but regardless it’s a very small percentage of the population. Cisco Champions seems to be starting similar to vExpert, a couple of hundred people. Cisco technology is fairly pervasive in terms of reach, probably more so than VMware so this number COULD grow. In comparison to Microsoft, based on population alone, the ratio of vExpert to VMware enthusiast/customer is probably high. The focus seem to be similar (contributing in community forums, TechNet, blog posts, books, community leadership from MVP website) vs a vExpert Evangelist who may spend their time talking about VMware and virtualization technologies, probably spending more time on twitter and their blogs than anything else (at least I do). Cisco could possibly grow Cisco Champions to the same size as vExperts (just based on the where both programs started), but does that make sense? Cisco has more than 11,000 CCIEs that is already a specialized community. Sure they aren’t necessarily ‘socializing’ Cisco products, but it’s a focused group. Cisco could choose to keep Cisco Champions small and focus on a small group of people with large reach. Does VMware need 1000 vExperts to socialize their products? 1000 people is a huge reach, but I’m sure that there is some overlap in North America and parts of Europe. If vExperts were cut down to 500 or less, would that be enough people to ‘evangelize’? It’s certainly possible, Eric Siebert at vSphere-Land canvasses votes for Virtualization Blogs every year. I’m sure if you just took those people plus some people on twitter and the forums, you could create a smaller list that have a large impact. You could also keep the vExpert numbers low by capping the years that you are a vExpert and forcing some sort of tour of duty. That may result in fresh people brought in each year with new ideas, but you may lose some of the ‘high impact’ people. I don’t know how they select the vExperts, but I’m still glad to be a member of this thousand member group. Looking at vExpert in comparison to a few other programs shows that it could either be too high of a population or possibly on track (depending on growth of Cisco Champions). You can also wonder too, is the VMware virtualization community just that more engaging that it warrants a higher number? I certainly enjoy this community and to know that there are 1000 more people that I have never heard or that are probably just as passionate is pretty cool. In the end, I don’t see VMware aiming to decrease the number though unless there is a huge uproar form vExperts to reverse the trend or if VMware just wants to change up the program and make it a lot more targeted. If they do want to reduce the numbers, I hope they try to ‘reboot’ the program with a new focus and good opportunities for new people to become vExpert. vExpert is just a recognition of contribution, it is not meant to be elite status, if you want elite status consider VCDX or CCIE level…stop ranting. Plus, virtualisation has taken off, therefore no surprise more people active in the social communities. nonetheless, you still applied knowing full well the numbers were increasing…anyway, this kind of nonsense blog posts annoys me. Thanks for the comment. My post was to point out that I saw older vExperts complaining about ‘diluting the eliteness’. The first two Twitter posts I reference are from VCDXs who are also vExperts, so maybe they have their priorities mixed up with vExpert? The focus of my post was this taken from their point of view as a reference, which may have been in error. This is my first year in the program and I joined because I enjoy the community and sharing things that I run into, so what do I know? I then tried to compare the program to other programs to see if the relative size was in alignment with other programs. My conclusion in the article is that the numbers are a little high vs the size of the community, but as @rnelson0 commented on Twitter (that is similar to your comment) there may just be a thousand passionate people who share their experience. I agree with those sentiments, this post was just speculation based on numbers and personal thoughts. The vExpert program managers are the only people who know if there is a target number in mind. Lastly as you mentioned, and I mentioned in my post, I did apply knowing that the numbers were increasing, and I would apply again regardless. Its a good program and I’m proud to be a member. Thanks again for the comment. Some discussions on Twitter echoed some of the same sentiment. vExpert program is meant to accredit people who have contributed rather than a elite title given which agreed with others. It is to show how the community by individuals for VMware has grown and to reward people who have contributed. MS might have many, but to be exact on just virtualization MVP, there are only less than 100 although the program has run many years. With the increased in number, this also add a value qualification that there are more people skilled and more willingly sharing on VMware communities than other technology either lack of expertise or not as willingly to share. With that, it also give customers an assurance that it is easier to hire a VMware guy than other technology. Also meaning to say communities is stronger to do certain tasks. Thanks for the comment. I was wondering what I got into at the time and wanted to try to compare with other programs (which I obviously didn’t know enough about). For VMware, I don’t think there is a downside to having X number of vExperts as long as they are contributing to the community. On the Twitter-sphere there was definitely grumbling by some long-time vExperts who felt that the program was being diluted.